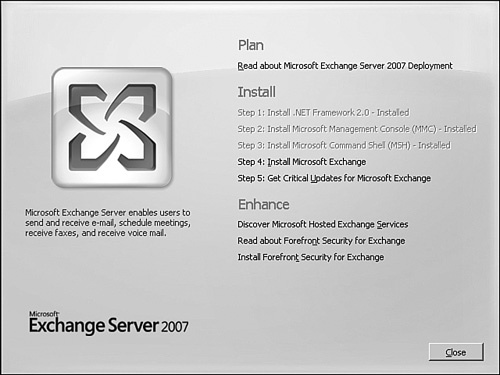 After the Exchange 2007 prerequisites have been installed on the server that will become the Exchange 2007 system, the next step is to install the Exchange 2007 application. In an environment where you have front-end and back-end servers, choose to migrate all of the front-end server(s) first before you install the back-end servers. With Exchange 2007, Client Access servers (CAS) can serve as both an Exchange 2007 CAS server and are fully functional as Exchange 2000 or 2003 front-end servers. This allows you to install a new Exchange 2007 CAS server and remove Exchange 2000 or 2003 front-end servers to complete the total replacement of all Exchange 2000 or 2003 front-end servers from the Exchange organization. Click Step 4: Install Microsoft Exchange. In the Microsoft Exchange Server Installation Wizard dialog box, on the Introduction page, click Next. At the License Agreement page, after reviewing the license agreement, click I Accept the Terms in the License Agreement, and then click Next. Figure 2. Exchange Server 2007 Setup Wizard with prerequisites completed. At the Customer Feedback page, select whether to participate in the Customer Experience Improvement Program by sending feedback automatically to Microsoft, and then click Next. At the Installation Type page, select the type of Exchange Server 2007 installation (Typical or Custom). Migrate all front-end servers to Exchange 2007 Client Access servers first. Then migrate all bridgehead servers to Exchange 2007 Hub Transport servers second. Finally, migrate back-end servers to Exchange 2007 Mailbox servers. The reason you need to migrate Exchange 2000 or 2003 front-end servers to Exchange 2007 Client Access servers first is because an Exchange 2007 Client Access server can fully host Exchange 2000 or 2003 front-end services as well as Exchange 2007 Client Access server functions. In contrast, an Exchange 2003 front-end server can only host the front-end process of an Exchange 2003 back-end server. Before you can migrate mailboxes from Exchange 2003 to Exchange 2007, the front-end server supporting the back-end server needs to be replaced with an Exchange 2007 Client Access server. After the front-end servers have been replaced, proceed with the installation of bridgehead servers being replaced one for one with Hub Transport servers. Hub Transport servers will service all Exchange 2000, 2003, and 2007 routing functions. Unlike the requirement for front-end servers to be replaced by Exchange Client Access servers before mailboxes are moved to Exchange 2007, all bridgehead servers do not necessarily need to be replaced by Hub Transport servers before the migration of mailboxes. Bridgehead servers will continue to successfully route information for both the Exchange 2003 and Exchange 2007 environment as long as at least one routing group connector exists between each Exchange routing group in the organization. After the front-end and bridgehead servers are replaced by CAS and Hub Transport servers, install Exchange 2007 Mailbox server systems and move mailbox data to the new servers. On the Installation page, if there is a need to change the installation folder, click Browse before proceeding and specify a path for the Exchange Server installation. Click Next to continue. In an Active Directory where Exchange 2000 or 2003 already exists, the next page will be the Mail Flow Server page. If you end up with an Exchange Organization Page prompting you to enter the name of the new Exchange organization, STOP! For some reason, the Exchange 2007 installation is not recognizing your existing Exchange 2000 or 2003 environment. You need the Mail Flow Server page for interoperability with an existing Exchange environment. Assuming you have the Exchange Mail Flow Server page, enter in the name of an Exchange server to which you want this new Exchange 2007 server to route messages, similar to what is shown in Figure 3. This mail flow creates a routing group connector between this new Exchange 2007 server and the Exchange 2000 or 2003 server. The Exchange 2000 or 2003 server you choose would be a bridgehead server in an environment with bridgehead servers; however, in an environment without a bridgehead server, the rule of thumb is to choose the Exchange 2000 or 2003 server that will be the last Exchange 2000 or 2003 server to be removed in your environment so that communications will remain operating as long as Exchange 2000 or 2003 exists in your environment. Figure 3. Setting mail flow server settings. New-RoutingGroupConnector –Name "E2003 to E2007 RGC" –SourceTransportServers "E2007Hub1.companyabc.com"
On the Readiness Checks page, the Installation Wizard is verifying that the appropriate Exchange Server prerequisites have been installed. View the status to determine if the organization and server role prerequisite checks completed successfully, and then click Install to implement the first Exchange Server 2007 server in the organization. This process might take a while as the Exchange software is installed on the system. During this process, you will see a screen similar to the one shown in Figure 4. Figure 4. Exchange 2007 setup in progress. If there are any errors returned or prerequisites not met on the Readiness Checks page, it is necessary to address these issues and retry the setup. After the installation has been completed, click Finish. After replacing an old Exchange 2000 or 2003 front-end server with an Exchange 2007 Client Access server, confirm you can render an Outlook Web Access page on the new Client Access server to mailboxes on the old Exchange 2000 or 2003 Mailbox server. After you confirm that all functions of the new Client Access server seem to operate, you can remove the old Exchange 2000 or 2003 front-end server for Exchange. Continue to install new Exchange 2007 Client Access servers to replace all Exchange 2000 or 2003 front-end servers, and then proceed with the same steps to install new Exchange 2007 Mailbox servers, this time choosing a custom installation of a Mailbox server. When a new Exchange 2007 Mailbox server has been added to the organization and you are ready to move mailboxes from Exchange 2000 or 2003 to Exchange 2007, proceed to the next section.